This allows us to create a project that matches your lifestyle needs, desired look and budget. If you are building a new home, the pool can be designed from plot plans and a site inspection. Through early planning, you can often save money and achieve a more integrated final product. 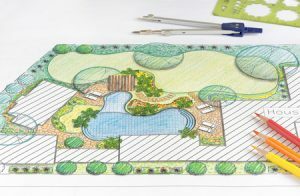 In order to help you visualize your backyard oasis, our design staff has photographs and color plans of many of our past projects for your review. We feel that one of the reasons we have won so many design awards is our ability to listen and hone in the plan and features that will best serve our client. In addition, we can develop a color rendering of the pool you and our expert designer will be creating together. This drawing will include a bird’s-eye-view and perspective drawing of what your finished project will look like. We feel that our job is to thoroughly explain all the pool features that may interest you. This explanation will include the positive and the negative traits of each product, including costs, function, and a recommendation depending upon the needs and desires you have expressed. LED pool and spa lights are now available and offer lower wattage than standard pool lights typically used in the industry. The ability to change the color of the pool water at night is an additional advantage our customers enjoy with LED pool lighting. VistaPro Pools & Spas embraces a solid reputation for our unique construction practices and providing cutting-edge technology and constant customer communication. We believe in building the “best value” into every project. After our project manager completes the design of your custom backyard living area with you, the plan is prepared for construction. The CAD construction plans are created and any special engineering is generated. Our processing department, construction team and project manager review the plans together and then apply for all required permits. The project is then painted on the ground followed by a site visit from your construction superintendent. This will be the first of many quality control inspections throughout the process. The next phase of the process begins with the excavation of the pool, spa and any sunken bar areas. We construct our pools with vertically excavated walls, create slight radius at the transition to the floor and flat floors. This type of construction requires more steel and concrete but the end result is a larger, more usable pool. This method of building also allows us to provide the best warranty in the pool industry. We can warranty your shell for as long as you own your home and this warranty can be transferred to a new owner. What really makes this building practice even more special is it also allows us to warranty the pool against rust “migration” or “bleed through” from the steel in the shell to the surface of the pool. We build all of our decks specifically for expansive soil. All of our poured decks have a continuous 4-inch turndown to prevent moisture from getting under the deck. If the ground underneath is expansive and needs to move, we want it to move independently from the pool shell. By floating the deck we can prevent damage to the shell and elaborate repairs to the surface of the deck. To learn more information about VistaPro’s pools or to start the pool building process at your home, please call us at 301-805-0119.